If anyone’s going to be involved in a big screen adaptation of George Orwell’s Animal Farm, it may as well be the master of motion-capture himself, Andy Serkis. The guy best known for bringing characters like Gollum, Caesar the ape, King Kong, and Snoke to life has been wanting to make a movie about Orwell’s political fable for years now, and he’s finally getting his shot at it. According to The Hollywood Reporter, Netflix has partnered with Serkis to bring Orwell’s 1945 novel to life. Serkis will direct and produce through The Imaginarium, the digital performance-capture company in London headed by him and Jonathan Cavendish. Serkis will also reunite with his War for the Planet of the Apes director Matt Reeves, who will also produce the new film. Serkis has been wanting to adapt Orwell’s animal-based allegory of Stalinist Russian since 2012 when he first acquired the rights to the novel, hoping it would be his directorial debut. He already checked that box off with last year’s drab and forgettable Breathe, but he’s probably hoping he’ll most make an impression as a director with his upcoming Mowgli. Serkis’ Jungle Book adaptation was set to open this fall, but just last week Netflix scooped it up and pushed its fall release to 2019. 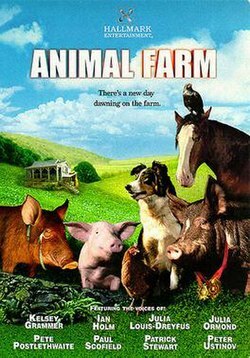 It was a weird choice to move such a massive technical endeavor to Netflix, but now with this Animal Farm deal it’s clear Netflix and Serkis have bigger plans for bringing technically ambitious projects to the streaming service. Plus, Netflix might be a more ideal place for a story that’s as angry and upsetting as the Orwell novel, which may not exactly have audiences flocking to the theaters. It certainly won’t be another Babe – although the cover of the Hallmark TV version of the book from 1999 makes it looks exactly like Babe.